The installation was located at 99021 Grapefruit Boulevard and Vander Veer Road in Mecca. It was, as the Artist noted, found “vandalized, burned, and stolen” from this site. No one has claimed responsibility and the “why” remains unanswered. Halter was an ambitious installation of Desert X. 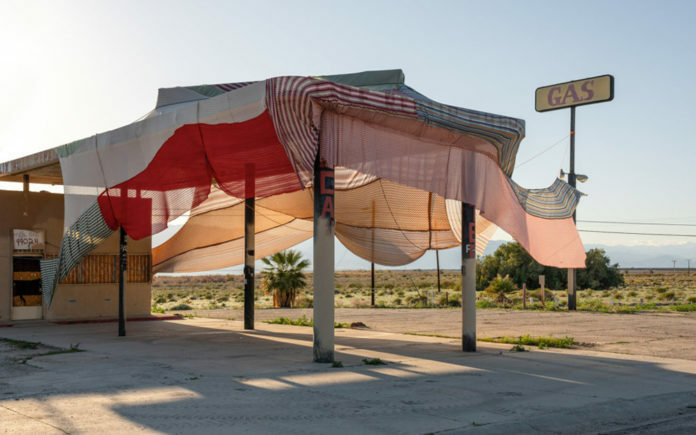 This site-specific work took a quintessential California gas station and draped the abandoned building in colorful fabrics. The site is reminiscent of a time when a gas station was the last bastion of comfort between endless miles of road. It was that gas tanks were filled, legs stretched and a cold drink was found. Mack gave visitors that similar reconnection. At Halter, visitors were able to have the same respite experience – walking between the blowing fabrics that created a tent and an umbrella from the elements. Why Halter was destroyed will likely remain a mystery. The destruction of art in any place for any reason is a cause for concern – most often our freest expression of freedom is the first to be suppressed. Or, perhaps, Halter is the true essence of Desert X, a site-specific work that it fell captive to the harshness and often experienced desolation of the desert.